Testing electrical circuits with a meter is commonly done with the power on. This is necessary to check component operation. Thus there is a significant risk of electrical shock. The voltages used can be extremely hazardous. Protect yourself with training and always remember the shock hazard is always there. If you are not confident, do not proceed. On the right you will see 2 types of clamp type temperature probes. These probes are used to measure the temperature of the surface of a pipe. These measurements are necessary for computation of superheat and subcool for refrigeration systems. 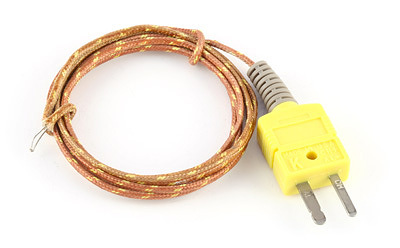 They are K type thermocouples and they can be used with a meter that has a k type thermocouple plug. The K type thermocouple can also look like this on the right. Note the yellow plug. This one way plug will fit into meters and thermometers with a like female plug. These probes are commonly used for air or water temperature readings. 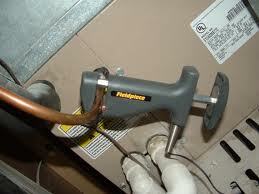 They can be also used to measure surface temperature on pipes for superheat and subcool. If you have a clamp type probe, it is a better choice for surface temperature readings. Below is a video on an accessory set of leads for the multimeter. These leads can be used to avoid shorts from the exposed lead tip. These clamps are screw on adaptors to to allow the use of the clamps to hold the contact with whatever terminals are being tested. 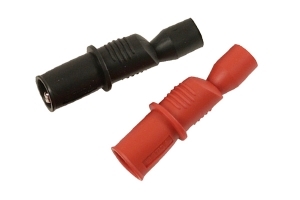 These come with the UEI meters and are available as accessories for meters with screw on adaptors on their leads. The above accessories are common ones that are found in the business. The list of cool stuff is ever expanding. As I look about I will add some of the ones I like best.